I’m so behind in blogging it’s embarrassing. There are a lot of reasons for it, but I miss sharing what I’ve been drinking, particularly as there have been some fabulous things to share. So, instead of allowing myself to continue being overwhelmed by the backlog, I’m taking the stack of purple index cards I use for tasting notes and diving in. It will take me a while to catch up, so expect to see a mix of reviews from a few weeks (or months) ago mixed in with what I’m drinking now, but hold onto your glasses because I’m back to your regularly scheduled blogging! 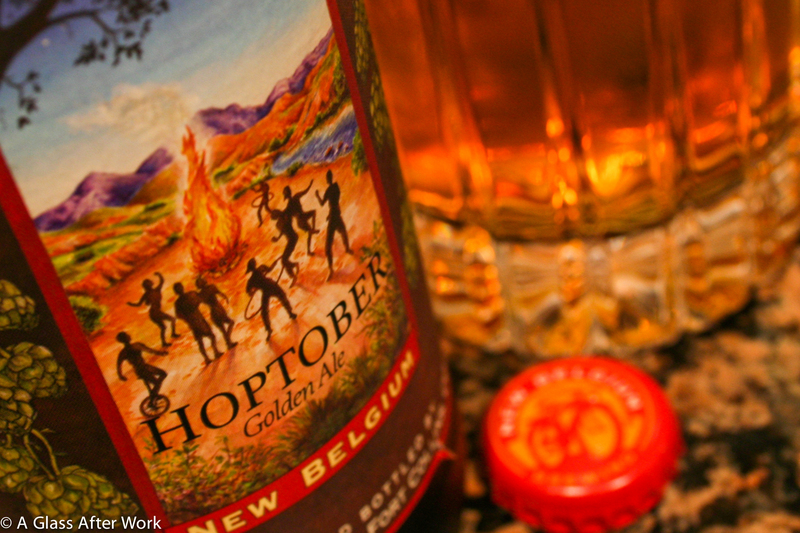 To get myself back on track, I’m actually going to blog about what I’m drinking tonight (Sunday night)…New Belgium Brewing Company’s Hoptober Golden Ale. Since running my first half marathon in Nashville back in April, my running has been sporadic. I ran a few 5ks, logged about 12 miles a week, and just couldn’t get my running legs back under me. As someone who has only been running for about a year and a half, that’s probably not too surprising, but I needed something to get me motivated again. So, when my friend suggested that I join her for the MCM10k, it was just the incentive I needed, and by Labor Day, I was in full training mode. Sunday morning was the race. I was up before the sun and headed out to the National Mall to meet the two girlfriends I was running the MCM10k with. It was a cold 34 degrees Fahrenheit and still wet from Saturday’s unusually snowy weather. We all started off strong, but fairly soon into the race we were headed off the Mall and onto the 14th Street Bridge, which was a sheet of ice. We ended up doing a mix of running/shuffling and fast walking for the next mile or so because it was impossible to avoid slipping while actually running. After that, it was a tough run, but felt good. That last .25 mile uphill, which was a killer way to end, but having the Marines there cheering us on was really motivating. I felt bad for the full marathoners who had to go up that hill after running 26 miles, as it was hard enough doing it after 6 miles. All in all it was a good race, and it left me feeling tired, a little sore, and all-to-ready for a good beer, my must-have after running drink. The New Belgium Brew Company’s Hoptober (brewery) was a light-to-medium topaz color, but it was bright and clear. On the nose and in the mouth, it was a little malty with the tiniest hint of citrus, but no overpowering flavors or aromas. It was medium-body beer with a thick, foamy head. Is this worth a glass after work? Definitely! If you see this wine in the store, grab it; you won’t be disappointed. At $10, this beer was the perfect for a relaxing Sunday afternoon. Admittedly, I wanted to fall in love with this beer, partly because it was my after race drink and partly because New Belgium Brewing Company just started distributing in the DC Metro Area. So, the fact that it was well-balanced and enjoyable obviously worked in its favor, but there also felt like there was something missing…some sort of pizzazz or personality that just wasn’t there. Overall, if you see this beer, grab it before it’s gone because I’m sure it will be hard to find after October But, if you miss it, that’s probably ok too. Question of the Day: Is there a particular food or drink that you look forward to indulging in after a particularly good workout?